Winston McKenzie, Nigel Farage’s UKIP candidate for Croydon North at next year’s General Election, wants to stop his branch members from holding a Christmas party. Ho! Ho! Ho! 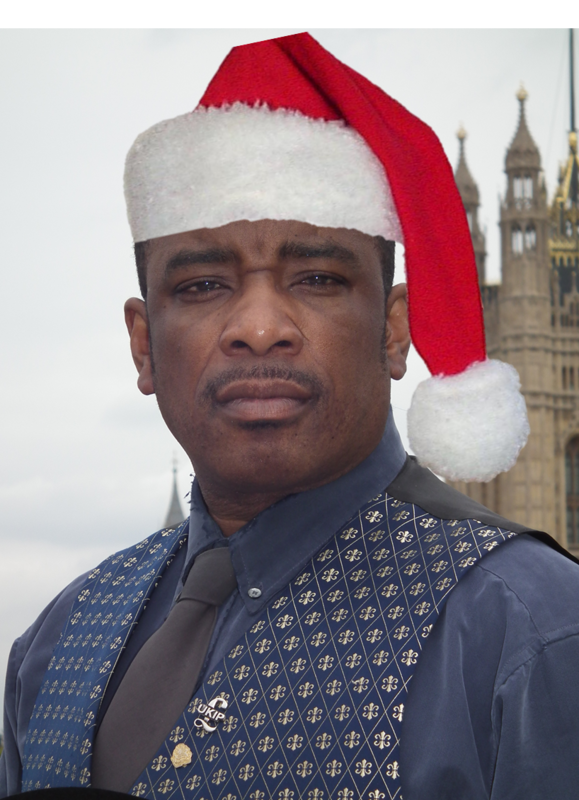 Is UKIP’s Winston McKenzie turning into the Grinch? Locally, McKenzie has become known as the “Chump from the Dump” since his televised remarks at his “Croydon Carnival” last spring, when he tried to explain why his party leader failed to show up at his election rally in the town centre. In his message to members of UKIP’s Lambeth and Croydon North branch, of which McKenzie is chairman, the failed ex-boxer and wannabe politician warns that if anyone dares stage an unauthorised Christmas party, they risk expulsion from the party. Could it just be that McKenzie has got the right hump because someone’s staging a Christmas party and he’s been dropped from the guest list? He is certainly no longer Mr Popular among his fellow UKIP members. In the past couple of weeks, McKenzie has seen a close colleague suspended from the party for mis-use of UKIP-tagged Twitter accounts, and then the Chump managed to kick one of his five-strong committee out of the branch for daring to ask questions about a £1,000 cash donation which was spent without any proper accounting. “It has been brought to my attention that certain members of the Lambeth & Croydon North Branch are proposing holding a selection of unauthorised fundraising meetings and events without seeking the consent of the Branch Chairman, nor of the Branch Committee. “May I take this opportunity to refer all concerned to the Party Rule Book, under Section F, 1-5, and the impending consequences that could occur should anyone wish to proceed in this vein, where it clearly states that those concerned would become subject to disciplinary action, which could prove to be detrimental to your status in the Party, and may even result in expulsion. “This is not a threat. I am simply making you aware of the consequences that Head Office may impose should you be reported as taking part. i.e., these meetings are against Party protocol. “N.B. Head Office have been notified. We contacted McKenzie by phone and email, mainly to invite him to the Christmas party we’re having at Inside Croydon Towers. At time of publishing, he’s not RSVP’d. This entry was posted in Croydon North, Winston McKenzie and tagged Christmas, Croydon North, UKIP, Winston McKenzie. Bookmark the permalink.